Nothing says international professional like a resume that boasts experience in several countries, but how do you put that together if you are fresh out of school, or even still in university? A great internship, that's how! But how are you even going to get your foot in the door when everyone is asking for experience? That's where we can help. What do you mean - anytime? Give yourself (and us) time to do a good job. Apply well in advance, at least two months before you want to come, even longer if you need a visa. That way you'll be sure that all the actors involved have plenty of time to help you in the most effective way. Spots are limited: working with individuals in a customised way means we can only accept a limited number of students: get in early and reserve your spot! If it's last minute and you want to come, give us a shout: we've worked miracles before! We will find you a great internship in Brussels using your profile and our network and reputation. You, my friend, instead of banging your head against the wall wondering why you hear crickets after applying to two hundred organisations, you'll be ironing your dress shirt and packing your bag. Make no mistake: you will need to work hard and earn your office's respect - we cannot do that for you. But you'll have a coach and mentor available to guide you, encourage you and strategise with you every step of the way. Now you probably know that Brussels has great chocolate, and beer, and mussels. But did you know that while eating and drinking and socialising, you can advance your career prospects and build a network that lasts a lifetime? Yep, it's called networking: we live and breathe by it and we will show you how it's done. Brussels is a complex and interesting city where you will find people from literally every country in the EU and the world. Click here to discover our favorite reasons to love Brussels, one of the most cosmopolitan cities in the world. Not paradise per se, just networking paradise. Oh yeah, and waffle paradise too. If you are an undergraduate or graduate student in a global university, or a recent graduate, you have come to the right place. Are you studying in the EU, Norway, Iceland or Switzerland? Click here and come on over the the European program page. The program is organised together with our academic partner, Vesalius College who provides you with the academic support of a dedicated Faculty Member. Visa invitation letters are provided when needed. Completing the internship and related academic paper earns you academic credit (the typical program awards 3 US credits; 6 US credits are possible) which can be transferred to your home institution. Step 1: As soon as you commit to the program, we work with you to optimise your self-presentation. Then, we find you an appropriate internship. And we find you a great housing solution, if you're going for the Comfy Cruise upgrade. Step 2: When you arrive in Brussels, you receive a full orientation about the city and the internship expectations. Typically, you will work in your office full time (typically 35-40 hours per week) for the duration of the program. Step 3: During your experience, we will meet regularly to talk about how you can use every ounce of your experience to learn about your chosen field and yourself, create a strong professional network and get opportunities through them and present your experience to its best advantage in your next applications. Vesalius College tuition for the internship seminar (3 US credits transferrable) with academic support (two-tree meetings with Faculty member and one paper) - If you are already enrolled in a University in the EU, Norway, Iceland or Switzerland, click on the European Student Program page. Apprehensive about making your way on your own in a foreign environment? Don't speak the local language (which one is it anyway?) Cast all worry aside and enjoy the royal treatment. We’ll secure appropriate housing for you and make sure it’s a safe area and a legitimate contract: you will still need to pay rent to the landlord, 400 – 700 €/ month depending on situation. 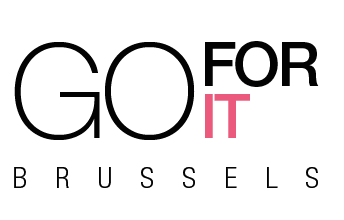 The Go For It Brussels guarantees an internship placement to each and every participant. That’s why we have an interview before you commit to the program: we will let you know what your options are and if it turns out your profile or your aspirations are not a good fit, we’ll tell you! We believe that everyone has a very special and unique set of talents, abilities and interests. We call this unique mix, the best part of your professional talents, your inner superhero. When you take part in the Go For It Brussels programs, not only you get some real world experience in an internship, you will also be encouraged to go a step forward at every turn to develop your special blend of talents, passions and personality that are the essence of the person you want to be. It takes some training to make a superhero, so with your permission we will be coaching you to develop a winning strategy, a killer attitude, and some great habits. Whether you are negotiating your schedule, asking for a day off or suggesting a new idea to your office, you will be training your superpowers every step of the way so that you develop the behaviour and though patterns of a professional, even if you don’t have much previous experience. We will be getting to know you more and more over the entire application period. We'll ask you to send us some information about your experience, interest, studies and personalities, then we'll speak for 30-40 minutes on skype in the Application interview. Along the whole process, you'll be developing your personal Success Plan, to make sure you have a clear set of goals for your experience in Brussels. Discover internships options, answer your questions. Tweak your resume and cover letter and coach you for an interview if required by the internship provider. We won't rest until we secure an appropriate internship position for you. Typically, placements are secured 3-4 weeks before arrival. Internship placements in the field of your interest are guaranteed for all participants. You will receive networking advice. We will practice negotiation techniques to start a discussion about your work schedule, your tasks, a recommendation. You can ask as many questions as you like during our meetings or ask for extra coaching whenever you feel the need to speak in depth about a topic. Intercultural communication is one of the key skills you will be practicing in Brussels. At the end of the internship, a formal evaluation from your host office will be collected . We will also facilitate some informal feedback and career strategy advice from our mentors and from the internship office on how to market your internship experience and make the most of the connections you have made to build your career going forward. Every participant in the program leaves with a career portfolio comprising an international network of professionals, new skills and qualifications, and a great new line on their resume. Go For It Brussels will write any student who participates in the program fully a recommendation letter on request. Usually internship offices also provide recommendation letters and agree to act as references.